The apex Igbo socio-political organisation, Ohanaeze Ndigbo has reacted to remark by the Vice President, Yemi Osinbajo that the South West can produce the next president if they vote for President Muhammadu Buhari in 2019. National Publicity Secretary of the body, Prince Uche Achi-Okpagha said such remark indicated that the Buhari-led government was out to deceive the various regions into voting for the ruling party in 2019. Achi-Okpagha said the Buhari government placed no premium on people of the South East. Speaking with Vanguard, on Wednesday, Achi-Okpagha said: “It is obvious from available and bleeding facts that to trust the present government of PMB is to build on sand. I have no reason also to doubt that this government does not place any premium on the Igbo. “The Igbo have suffered the worst neglect and victimisation ever under this government. It is more disheartening because the more we complain or unveil the deficiencies and discrepancies, the more policies, programmes and appointments among others, are made with blatant disregard to the chagrin of the lgbo. “It was clinically laid bare by the last recommendation of EFCC board members to the Senate without south-east and south-south memberships. There is no gainsaying that apart from the statutory ministerial appointment per state, the Igbo are nowhere to be found in this government. “Right from the outset of Buhari’s government, he did not mince words or mumble on his resolve to skip the south-east with her “five per cent” vote in 2015. 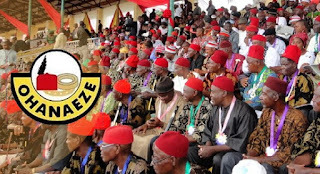 It is therefore not in doubt that any promise of Igbo presidency in 2023 by this government is a complete and callous hoax on the Igbo nation. “The insincerity of this government has made her an enemy to the people and as Robin Hood would have it, “there is no trust in a promise made by an enemy. “It is a pity that the vice president, Prof Yemi Osinbajo, a professor of Law and above all, an ordained priest of the Most High God could accept to be used like a toilet tissue, to prosecute this precipitous political peregrination. “This is a government that is pathologically replete with her deceptive embellishments. Note that neither President Buhari nor any northern political stalwart has made a pronouncement on the 2023 presidency. “Instead, they have allowed some cabinet members of Yoruba extraction, including Osinbajo and Fashola, to dissipate energy to the effect that the south-west would have presidency in 2023.